India is the second biggest rice-producing country in the world after China. It contributes about 20% of world output of rice. Rice (paddy) is grown in almost all the provinces of the country, but more than 86% of the total production accounts for West Bengal, Andhra Pradesh, Tamil Nadu, Uttar Pradesh, Bihar, Orissa, Madhya Pradesh, Punjab, and Assam states. Rice production, processing, and marketing constitute the biggest industry in the country. Indian rice milling industry is the largest and oldest agro-based industry, and 58.45% of the Indian population depends mainly on agriculture for their livelihood. Paddy being the major cereal crop of India covers an area of more than 42.8 million hectares (approx. ), the largest under any single crop. The cultivation of rice (Oryza spp.) is usually carried out in an irrigated paddy field. After harvesting, it is dried and milled. A rice grain is made up of an external husk layer, a bran layer, and the endosperm. In rice mill, the husk layer is removed from the paddy by de-husking or de-hulling, and during this process a large amount of dust is generated, especially during milling process. Diseases of the respiratory system induced by occupational dusts are influenced mostly by the duration of exposure and the type of dust. Rice mill workers are potentially exposed to this dust and chemicals that may have adverse effects on their respiratory health. Several reports suggested that unprotected dust exposure in agricultural settings may lead to pulmonary fibrosis.,, Grain dust has a long history of association with respiratory diseases and adversely effects various organs of the body. Asthma has been well-documented as a result of exposure. Rice husk also has high silica content. This biogenic silica may cause pulmonary disease resembling asbestosis, such as pleural thickening, fibrosis, and possibly bronchogenic carcinoma. Husk generated in the rice mill is a hazardous substance, with respiratory sensitizing properties and may provoke asthma and chronic bronchitis. In occupational lung disease, spirometry is one of the most important diagnostic tools. It is the most widely used, most basic, effort-dependent pulmonary function test (PFT) and can measure the effects of obstruction and restriction on lung function. Periodic re-testing of workers can detect pulmonary disease in earliest stages when corrective measures are more likely to be beneficial. Such intervention includes improvement in industrial hygiene control, job transfer, or medical treatment. In addition, PFTs are assumed to have a key role in epidemiological studies investigating the incidence, natural history, and causality of occupational and environmental respiratory diseases. Burdwan is one of the largest rice-producing districts in West Bengal and is the only district in the state to have both industry and agriculture. On an average, 58% of the total population of Burdwan belongs to the agricultural population. Literature search could not reveal many documented study on respiratory morbidity among rice mill workers in this part of the country. There are only few recent studies, in other regions of India which showed higher prevalence of respiratory morbidity among rice mill workers. 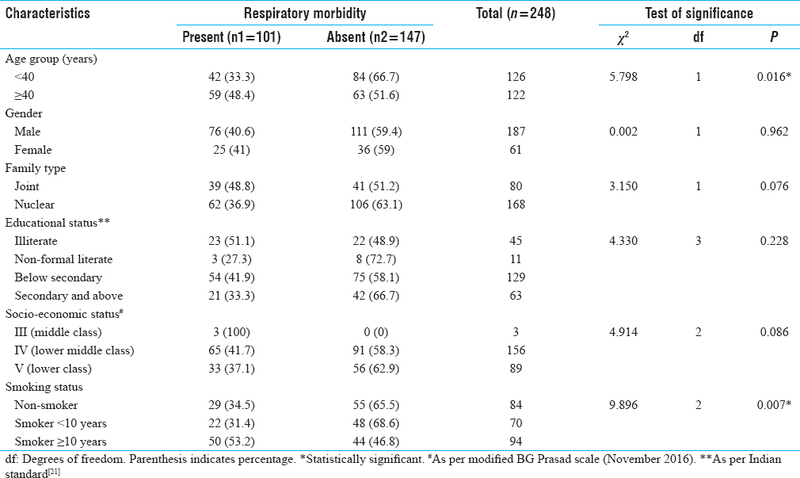 In this context, this study was carried out in the district headquarter of undivided Burdwan district to find out the prevalence and pattern of respiratory morbidity among rice mill workers and to find out any association of respiratory morbidity among the rice mill workers with their background characteristics. A descriptive cross-sectional study was conducted during July–December 2016 among rice mill workers of the rice mills situated at Burdwan municipality area of Burdwan district, West Bengal, India. Workers who were directly engaged in the process of steeping, boiling, milling, loading–unloading, and actively handling of rice in rice mill and who gave written consent for the study were included in the study. Workers (i) who had pre-existing known heart diseases, chronic abdominal distress, any recent gastro-intestinal, and thoracic surgery; (ii) who were seriously ill at the time of data collection and on medication for respiratory illness; and (iii) absent even after two repeat visits were excluded from the study. In the paucity of literature in this part of the country, considering 44.2% prevalence (p) of respiratory morbidity from a study in South India, standard normal deviate (Z) at 95% confidence interval, 15% relative precision, and 10% non-response, the sample size was calculated to be 248. There are 35 rice mills in the Burdwan municipality area, and 20% of the total 35 rice mills (i.e., 7) were chosen by simple random sampling (SRS) technique. Equal proportion of eligible sample population (248/7 = 35.45 = 36) was included from each selected rice mill by SRS technique. Finally, four subjects were non-respondent during data collection period, and thus 248 subjects could finally be studied (response rate = 98.42%). The study proposal was approved by institutional ethics committee of Burdwan Medical College, Burdwan. Before data collection, permission and co-operation were sought from owners of each rice mill. The nature and purpose of the study with associated risk and benefits were also described in detail individually to the entire study population, confidentiality of their information was assured, and after that written consent was obtained from all of them. The selected individual study subjects were interviewed using predesigned, pretested, semi-structured schedule at their workplace. The background characteristics (socio-demographic and occupation-related) of the subjects were noted by interviewing them. Anthropometric measurements: body weight in kilogram with the help of standardized portable adult-type weighing machine and height in centimeter by non-stretchable measuring tape, were done following standard guidelines, and accordingly body mass index [BMI (kg/m2)] was calculated. Physical examination of all the subjects was done with the help of stethoscope and sphygmomanometer, and privacy was maintained during physical examination of female subjects. Findings of physical examination were noted and cross-checked with relevant records (if, any). Subjects who were not eligible for the study and also for spirometry were excluded. After that individual subjects underwent spirometry procedure. Spirometry was carried out using noseclip and separate mouthpiece for each individual, by a technically skilled person using portable, digital spirometer (Spirolab III ver. 3.4 SN312944). PFT with spirometry of all the participants was carried out at a fixed and convenient time of their working day. Before the process of spirometry and after proper demonstration of the test, all participants were explained about the steps, maneuvers, and procedures in detail and were encouraged to practice the maneuver before performing the test (as per special reference to the statement of American Thoracic Society). Individuals with abnormal test results were given primary advice and referred to consult appropriate physician. Based on spirometry, different PFT parameters were measured: forced expiratory volume in first second (FEV1), forced vital capacity (FVC), FEV1/FVC, peak expiratory flow rate (PEFR), and FEF25-75 (forced expiratory flow). Individual with any abnormal spirometry findings was considered as presence of respiratory morbidity, the primary outcome variable of the study. With further specification, respiratory morbidity was classified as obstructive (mild, moderate, and severe) and restrictive (mild, moderate, and severe) lung disorders as per the findings of PFTs. All collected data were compiled and entered into Microsoft Excel 2007. Data were checked for consistency and completeness, and then analyzed using SPSS version 20.0 software. Descriptive statistics were followed, and mean, standard deviation (SD), median, interquartile range (IQR), proportion were calculated. Respiratory morbidity (present = 1, absent = 0) was considered as the main outcome variable and background characteristics of subjects as independent variables/predictors. Chi-square test and bivariate and multiple logistic regression analysis were applied. A P value <0.05 was considered as statistically significant. Among 248 rice mill workers studied, none was below 18 years or ≥60 years of age, and the mean age was 38.89 ± 9.013 years; three-fourths of the subjects (75.4%) were male, and the majority were Hindu (71.77%), general caste (75%), and from nuclear family (67.74%). Of 248 subjects, 18.14% were illiterate and another 32.66% had primary-level education; nd 62.9% belonged to lower-middle socio-economic status. The median duration of smoking among 164 smokers was 10 years (IQR 5–12 years); about one-fourth workers had experience of working in rice mill for 10–14 years (median = 11 years, IQR 5–19) and almost three-fourths (74.5%) had ≥9 h average working hours per day (median = 9 h, IQR 7–9 h). 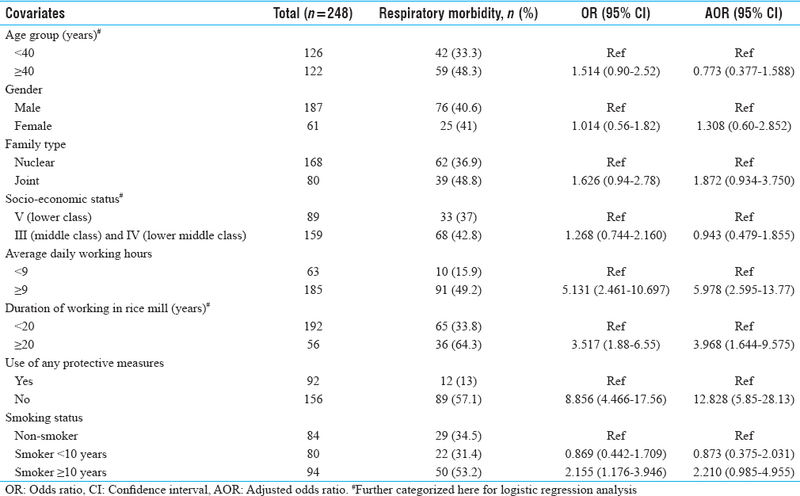 Among 248 rice mill workers, 101 (40.73%) had respiratory morbidity, as determined based on any abnormal spirometry findings, with the prevalence of obstructive and restrictive lung disorders being 24.60% and 16.13%, respectively [Table 1]. Further interpretation of spirometry findings revealed that most of obstructive (65.57%) and restrictive (77.50%) morbidity belonged to mild grades. Further analysis revealed that few background characteristics of participants such as age, average duration of working hours per day, duration of working experience (years) in rice mill, use of any protective measures, and smoking status were significantly associated (P< 0.05) with respiratory morbidity [Table 2] and [Table 3]. [Table 4] depicts bivariate and multiple logistic regression analysis of respiratory morbidity and its covariates among rice mill workers. OBC category of workers [odds ratio (OR) = 4.33 (1.23–15.20)], not using any protective measures [OR = 8.856 (4.466–17.56)], working daily in rice mill for an average duration of 9 h or more [OR = 5.131 (2.461–10.697)], working in rice mill for 20 years or more [OR = 3.517 (1.88–6.55)], and who were smoker for 10 years or more [OR = 2.155 (1.176–3.946)] found to be significantly associated on bivariate analysis. However, after adjusting the effect of other variables, multiple logistic regression model shows that use of any protective measures, average daily working hours, and duration of working in rice mill were significant predictors of respiratory morbidity. The risk of respiratory morbidity was 12 times more among subjects who were not using any protective measures [adjusted odds ratio (AOR) = 12.828 (5.85–28.13)], almost six times more than who were working daily in rice mill for an average duration of 9 h or more [AOR = 5.978 (2.595–13.77)], and almost four times more than who were working in rice mill for 20 years or more [AOR = 3.968 (1.644–9.575)] than their counterparts. Multiple logistic regression model was significant and good fit as evident from significant Omnibus test (P = 0.000) and non-significant Hosmer–Lemeshow test (P = 0.442). All the independent variables explained 45.1% of dependent variables as explained by Negelkerke R2 statistic. Occupational lung disease is a lung condition that develops as a result of a person inhaling harmful substances at his or her workplace. Occupational lung diseases are the most common work-related illness, but fortunately many are preventable or controllable with proper treatment. They are mainly caused by dust that goes into lungs (pneumoconiosis). Assessing the risk of such occupational morbidity helps in identifying appropriate measures for prevention and control. The present cross-sectional study was conducted among 248 eligible rice mill workers; 50.8% were below 40 years age group, and the mean age was 38.89 ± 9.013 years and there were no workers belonging to geriatric and child age group. Three-fourths were male. Most of them (62.90%) were from lower-middle class family, and none of them was from upper or upper middle-class family. Almost similar characteristics of the workers were reported in earlier studies by Prakash et al. (majority of the workers were in the age group of 25–35 years (43%) with 80% male and 46.66% from lower socio-economic status) and Musal et al. (mean age of the workers was 40.17 years (SD = 8.86 years)]. 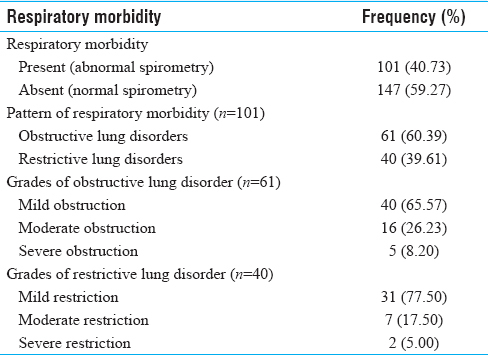 The spirometry findings/PFT parameters in our study revealed that respiratory morbidity was present among 40.73% subjects, and among them obstructive lung disease was more prevalent than restrictive lung diseases. Ghosh et al. and Prakash et al. also reported a slightly higher prevalence of respiratory morbidity as 44.2% and 42.66%, respectively, which might be due to different sampling techniques. In the absence of Personal Protective Equipments (eg. mask, respirator), workers reported to use their personal clothes (towel) as protective measures. This study revealed that the presence of respiratory morbidity was significantly more among workers who were not using any protective measures [AOR = 12.828 (5.85–28.13)], working daily in rice mills for 9 h or more [AOR = 5.978 (2.595–13.77)], and also among those who were working in rice mill for 20 years or more [AOR = 3.968 (1.644–9.575)]. Clearly, increased duration of exposure and non-use of any protective measures were found to increase the risk of respiratory morbidity. Similar observations of significant association between duration of employment and the presence of respiratory morbidity among workers were reported by Ghosh et al. and Prakash et al. Significant association between respiratory morbidity and duration (years) of working in rice mill was reported by Musal et al. Another study conducted in the mills of Amritsar district with a comparison group showed that an increase in the duration of work in rice mill adversely affects most of the PFT parameters. The study indicated that a considerable proportion of workers were having respiratory morbidity, with majority of them having obstructive type of morbidity. Although a larger sample size would have been required to estimate the pattern (obstructive/restrictive) of morbidity and its severity (mild/moderate/severe). Other limitations of the study are as follows: Etiologic diagnosis of respiratory morbidity was not possible by spirometry, the maneuver during spirometry is highly dependent on co-operation, and effort of individuals. Since the results are dependent on individual, there may be under-estimation of FVC, and finally as this was a cross-sectional study, temporal association could not be established. In spite of these limitations, the major strengths of our study are as follows: Workers who were directly involved in the process were included for accurate measurement of prevalence of respiratory morbidity and cross-checked by means of physical examination and review of records. Respiratory morbidity was diagnosed not by their symptoms, but by spirometry at a time convenient for workers and also in the same time period of a day to maintain uniformity and to avoid any diurnal variation. Thus, chance of false-positive interpretation was minimized. Primary treatment, necessary advice, and health education were provided mainly to workers who had any respiratory morbidity. Respiratory morbidity is quite high in this area, particularly obstructive lung diseases being predominant among rice mill workers. The duration of exposure and non-use of protective measures were significant determinants for respiratory morbidity among rice mill workers in Burdwan municipality area. As the duration of exposure to dust increases, the respiratory morbidity increases which can be explained by dose–response relationship. Awareness generation among workers, provision and promotion of use of protective devices (such as respiratory mask), and provision of occupational health services (such as pre-placement examination, periodic physical examination, and health educational activities) as per the norms of The Factories Act, 1948 and also The Employees' State Insurance Act, 1948 to improve health, welfare, and safety of the workers are some of the measures to be implemented with priority. The authors sincerely acknowledge the co-operation and assistance of the rice mill workers. Nayak P. Problems and prospects of rice mill modernization: A case study. J Assam University 1996;1:22-8. Tripathi A, Singh NB, Bansode FW, Singh RK. Hematological complications in rice mill workers of district Allahabad, Uttar Pradesh. Bull Environ Pharmacol Life Sci 2014;4:101-2. Agriculture: National Portal of India. Government of India. Available from: http://india.gov.in/sectors/agriculture/index.php. [Last accessed on 2016 Jun 28]. Food and Agricultural Organization (1995): FAOSTAT, Agricultural Data. United Nations; Available from: http://faostat.fao.org/faostat/collections?subset=agriculture. [Last accessed on 2016 Jun 28]. Czeslawa S, Barbara M, Jacek D, Ewa KT, Janusz M, Helen F, et al. Effects of exposure to grain dust in polish farmers: Work related symptoms and immunological response to microbial antigens associated with dust. Ann Agric Environ Med 1998;5:147-53. Mengesha A, Bekele A. Relative chronic effects of occupational dusts on respiratory indices and health of workers in three Ethiopian factories. Am J Ind Med 1998;34:373-80. Musal R, Naingl L, Ahmadl Z, Kamarul Y. Respiratory health of rice millers in Kelantan, Malaysia. Southeast Asian J Trop Med Public Health 2000;31:575-8. Glyseth B, Stettler L, Mowe G, Skaug V, Lexow P. A striking deposition of mineral particles in the lungs of a farmer: A case report. Am J Ind Med 1984;6:231-40. Green FH, Yoshida K, Fick G, Paul J, Hugh A, Green WF. Characterization of airborne mineral dusts associated with farming activities in rural Alberta, Canada. Int Arch Occup Environ Health 1990;62:423-30. Sherwin RP, Barman ML, Abraham JL. Silicate pneumoconiosis of farm workers. Lab Invest 1979;40:576-82. Hurst TS, Dosman JA. Characterization of health effects of grain dust exposures. Am J Ind Med 1990;17:27-32. Standards and Industrial Research Institute of Malaysia. Evaluation of rice-husk as a cleaning agent for turbo jet engines. Berita SIRIM 1983;8:2. Newman R. Association of biogenic silica with disease. Nutr Cancer 1986;8:217-21. Dosman JA, Graham BL, Cotton DJ. Chronic bronchitis and exposure to cereal grain dust. Am Rev Resp Dis 1979;120:477-80. Ruppel GL. Pulmonary function testing—Trends and techniques. Resp Care Clinics North Amer 1997;3:155-81. Edward H, Ray T, McKay P. Pulmonary function testing in industry. In: Carl Z, Bruce O, Dickerson E, Horvath P, editors. Occupational medicine. 3rd ed. London: Mosby; 1994. p. 229. Agriculture: Burdwan District. Available from: http://bardhaman.nic.in/agri/agriculture.htm. [Last accessed on 2016 Dec 19]. Prakash S, Manjunatha S, Shashikala C. Morbidity patterns among rice mill workers: A cross sectional study. Indian J Occup Environ Med 2010;14:91-3. Ghosh T, Gangopadhyay S, Das B. Prevalence of respiratory symptoms and disorders among rice mill workers in India. Environ Health Prev Med 2014;19:226. American Thoracic Society. Statement on standardization of spirometry. Am Rev Res Dis 1987;136:1286-96. Ministry of Human Resource Development, Government of India. Indian Standard Classification of Education. New Delhi: Ministry of Human Resource and Development, Government of India; 2014. Dhillon S, Bassi R, Kaur H. A study of lung function abnormalities in workers of rice-mills. Indian J Fundamental Applied Life Sci 2011;1:217-20.